Current archaeological research indicates that from ca. AD 1000 to 1200 permanent settlement was in the windward areas of Hawai‘i Island, where rainfall was sufficient for successful growing of crops near the shore, population gradually spread throughout these windward areas during these centuries. By the A.D. 1200s-1300s, it seems likely that Kona or parts of Kona had formed into a small settlement(s) with a ruler, local chiefs and commoners. Oral histories indicate that other settlements existed on the island, with Hilo and Hamakua (the later controlled by Waipi‘o) and several in Kohala of note. Small national heiau were present at this time. Most historians estimate that Pa‘ao came to Hawai‘i (reportedly from Tahiti) around AD 1300. He arrived with his warriors, priests (kahunas) and new rulers (ali‘i). Pa‘ao is credited as initiating and/or expanding the kapu system of social structure, religion and order in Hawai‘i. In the A.D. 1400s-1500s, the island became unified under the Pili line of rulers; based in Waipi‘o on the Hāmākua coast. In the time of the ruler ‘Umi-a-Liloa, ca. A.D. 1490-1525, the Royal Center was moved from Waipi‘o and Royal Centers in Kona became of importance. From Kailua-Kona to Keauhou covers the entire length of Ali‘i Drive, seven miles of roadway and over seven centuries of Hawaiian Royalty archaeological, historic and cultural traditions that have shaped Hawai‘i into what it is today. The focal point of Hawaiian social order and kapu was the ali‘i, or royal class. From this highborn group came the ruler-caretakers of the islands. The Ali‘i of Hawai‘i achieved such envied status primarily through strong genealogical connections. In the centuries prior to 1778, several large and densely populated Royal Centers were located along the shoreline between Kailua and Hōnaunau. Hōlualoa – Area with numerous heiau and good surf. Associated with Keolonahihi in the ca. 1300, Keakamahana and Keakealaniwahine in ca. 1600 and Kamehameha I in the 18th Century. Kahalu‘u – Complex of multiple heiau surrounding Kahalu‘u Bay. Keauhou – This area is noted for the largest hōlua slide in Hawai‘i called Kaneaka, the surfing area called Kaulu, and numerous heiau. The Royal Centers were areas selected by the ali‘i for their residences and ali‘i often moved between several residences throughout the year. The Royal Centers were selected for their abundance of resources and recreation opportunities, with good surfing and canoe-landing sites being favored. With Kamehameha’s death in 1819, Liholiho (his son) and Ka‘ahumanu (his widow) assumed control of the kingdom. Shortly thereafter, the capital of the kingdom was moved from Hawai‘i Island, never to return. In the absence of the king, high chief Kuakini (brother of Ka‘ahumanu) was eventually appointed governor of Hawai‘i Island and became an extremely powerful figure on the island. Kuakini resided primarily in Kailua Village. Here, the missionaries arrived in 1820, establishing a station where Kuakini and his many subjects lived. On July 18, 1823, Ellis and his missionary companions traveled via the ala loa or ancient foot trail near the coast. There are a number of documentary resources (i.e. Māhele records, journal accounts, and survey documentation) that place the ancient ala loa in the vicinity of the “Government Road”, now known as Ali‘i Drive. Along the seven-mile stretch of land between Kailua to Keauhou, Ellis counted 610 houses and 19 heiau, and estimated the uplands contained another 100 houses. In 1882, Queen Kapi‘olani brought four trees to Kona. Two were reportedly cuttings from a banyan tree at ‘Iolani Palace where they had been presented by royals from India. One banyan was planted at Hulihee Palace and later, in 1906, the Maguire family transplanted one that now stands near the entrance to Kailua Pier. The other two trees were Moreton Bay Figs. One was planted at Holualoa Bay to mark the site where canoes were blessed and launched and it recently met its demise. The second was a gift from the Queen to Alexander Burgess and he planted it fronting his beach house – the present site of the Banyan Court Mall. Today, Ali‘i Drive is a perfect setting for walking, running or biking, for the casual to competitive. Mile markers pace individual performance and guide exercisers along its level, picturesque course. Beautiful views and sweeping vistas make for pleasant drives; turn a corner and you move quickly from a strong lava flow shoreline to crystal clear white sand beaches, then quickly back again. 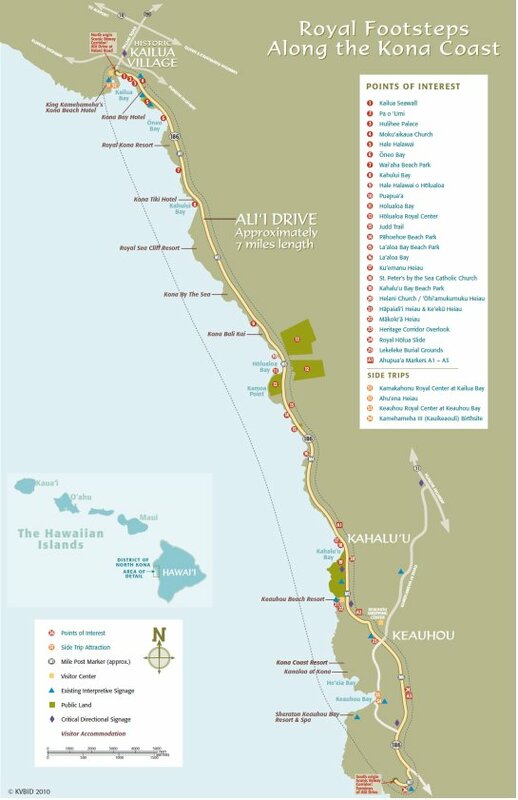 Click HERE to view/download for more information on Along Ali‘i Drive.